Some time ago now I stumbled across a freeware game for windows called Crayon Physics and instantly fell in love with it. The premise of the game is very simple – there is a ball on one side of the screen and a star on the other side. Your task is to get the ball to the star. That’s it! It doesn’t sound much fun does it, but trust me – this is essentially electronic crack – it’s that addictive. What makes the game so compelling is the method by which you play it. Essentially you draw things on the screen and, the very instant you finish drawing them, they become real – they will instantly start interacting with the rest of the scene according to the rules of physics. For example, if you draw a box in the middle of the screen then it will start falling under gravity until it hits the ground. If that box smacks against your ball then it will impart some of its momentum to the ball and start it moving. You can create see-saws, dominoes, ramps or whatever else you can dream up. Anything you can imagine – just draw it on the screen and watch it come alive..well…almost. The version of crayon physics linked to above (and again here) is essentially just a technical demo – written in only a week by its author Petri Purho. The practical upshot of this is that the only objects you can create in this freeware version of crayon physics are boxes and blobs. You might think that this technical limitation would ruin what sounds like a wonderful idea but, to be honest, it doesn’t. The game is still fantastic fun and everyone in my office was instantly hooked on the game, its beautiful soundtrack (which is available for download in mp3 format here) and the lovely, childlike crayon drawings. 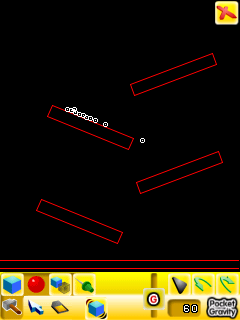 Petri is currently working on a much more advanced version of the game which is called Crayon Physics Deluxe. This souped up version of crayon physics promises to deliver exactly what we want – full freedom to draw pretty much anything you like on screen and watch it come to life. To get an idea of how wonderful this will be check out this youtube video of Petri playing an early beta of the deluxe version on a tablet PC. Note that this is NOT the free version linked to above – this is a work in progress version of a much more polished game. For many people, Crayon Physics Deluxe is one of the most anticipated games this year and to top it off it won this years Independent Games Festival. It looks like its going to be a commercial offering – and I can’t say I blame the author if thats the way it goes. He has put a lot of effort into it and deserves to be rewarded for his work. Personally, I will buy it the very instant it is made available for sale and then book two days off work so I can spend time enjoying it without interruption. If you want to read more about the game then check out the links here, here and here. Some people can’t wait, however, some people want more of this kind of thing and they want it yesterday. So what else is out there? While waiting for the release of Crayon Physics Deluxe, you can get more mileage out of Petri’s freeware version by installing extra levels. A whole community has sprung up around creating levels for the game and many, many different ones can be downloaded from this unofficial game blog. There is an amazing amount of variety on offer – some of the new levels use the same graphical style as the original while others make it look like a completely different game. Check out this pack, for example, which uses graphics from retro games such as pacman and donkey-kong. Some of my friends refer to me as Betamax man because I seem to have a knack for choosing exactly the wrong platform. For example, I bought a Palm OS based PDA just before Windows Mobile blew it out of the water in just about every area. I also have a Playstation Portable which is a great piece of kit but all of the really cool stuff seems to be coming out on the Nintendo DS. Pocket Physics is an example of the kind of thing I mean. By looking at the screenshots below you can see that it got its inspiration from Crayon Physics but, as the author says, its not really a game as you are not required to actually achieve anything. Instead, it is a construction kit where you can draw your own little world and just have fun with it. Yet another excuse for me to part with my hard-earned and get a NDS. One piece of hardware I do actually own is a Windows Mobile based mobile phone and just this morning I discovered a wonderful free application for it called Pocket Gravity. The concept is very similar to Pocket Physics – there is no game element to it – you just draw things on screen and play around with them. Just like all the other offerings here – as soon as you finish drawing your objects they become part of the virtual world – subject to the laws of physics as you would expect. Although not as graphically polished as Crayon physics or Pocket Physics this is a great little application to play around with and it will be keeping me occupied on the commute to work for the next few days. I don’t have an iPhone and I don’t intend on getting one soon (am Betamax man – remember?) but if you do have one then you might want to try out iPhysics which is the same sort of thing as Pocket Physics and Pocket Gravity. If you have tried this application out then please let me know what you think of it in the comments. If you still haven’t had enough then there is even more out there to help satisfy your physics-based cravings. I will briefly mention them here for the sake of completeness but will talk about them more in future posts. You’ve got phun, box2d, and BulletPhysics. Enjoy! I happened to stumble upon your blog searching for some information anout the new Matlab MuPAD engine, but I’ve found something much better! Thanks for the recommendation – I love games like this one. By the way, perhaps your readers will be interested in another great (online) physics game, Fantastic Contraption – just google the name and click the first option (nope, not affiliated with it in any way :) ). Thanks for the tip – will be checking it out later. There is some information on Walking Randomly about the new Mupad engine in MATLAB and I am planning on writing more in the future. If you click on the Matlab tag on the left hand side of this page and scroll down a bit then you will see my review of it.